Voiceover talent doesn’t come naturally to everyone, but having the right tools, advice, and some great background music from Shockwave-Sound.com is a great way to get started. Whether you’re working on a low budget podcast, give prerecorded presentations, or plan to work in the film industry, everyone looking to accomplish voiceover work has to start somewhere. Sometimes just knowing what you need can be a challenge. Max Laing has spent decades working with audio recording, and he recently shared some advice on how to get started with voiceover recording. How and why did you choose to get started in radio and voice work? Somebody made the mistake of telling me I had a good voice a long time ago, and when people weren’t looking I’d walk up to a microphone that somebody happened to leave on or whatever and I could hear myself rumble through these big speakers. All of a sudden, that was a new level of power. I was very used to low frequencies anyway because I played the tuba, so anything that was very low and the rumbling tones, the fact that I could produce that with my voice back then was just an amazing thing. Of course you can’t do that very loud with the human body. Most people can’t, and I’m the same. Just because I can produce the tone doesn’t mean that I could project it. But the microphones – now that allowed my voice to be projected and I’ll tell you what, one’s rumbling voice combined with amplification the first time and it was over with. I was hooked. After that, came the whole new world of equalization and taking out the highs and lows and making it sound like you know what you’re talking about. What would you say is your formula for creating a good voiceover? Well, certainly it goes without saying, if it’s not something that’s whimsical, if it’s going to be meaningful and means something to the person that’s asking to do it, then you’ve got to be in the right mindset. If you’re aggravated, it’s going to come out in your voice. It’s very hard to mask that. That’s just on the personal end. The flip side of that on the technology end is you’ve got to have a flat room. You’ve got to get rid of all the extra noise in the background. You’ve got to be able to amp up your mic as much as possible while you deaden the rest of the room. You want a flat, flat, flat response. Nothing extra boomy, nothing extra tinty, all the popping p’s – you want to get everything out of the way. You warm up with some of the standard little things that everybody says, “Wheat checks, rice checks, corn checks” – you want to make sure the mic is not popping on your voice. You’ll say a few “p” words, a few “s” words, making sure you’re not hissing. You listen to a couple of the initial recordings back to make sure you don’t have a fan running in the background; as we’ve converted from tape machines, well we’ve now gone into computers and with computers comes what? Fans. And they have fans all over the place. Some of them enough to cause a small tornado. So you’ve got to really keep down as much of that background noise as possible. One of the tricks is to put a noise gate on the mic so that the gate or openness of the mic isn’t actually on until you’re making a noise above a certain level. So when you get it set just right, your voice will be over any extra background noise that you’re not able to contain. Then as soon as you stop speaking, it “closes” the gate, preventing that background noise from seeping through. That’s one of the very powerful tricks that everybody in that business uses. To be able to suppress as much sound as possible and mask it in ways – and that’s what a noise gate allows you to do is mask it with your own voice – but when you’re not speaking and the gaps between what you’re saying, where the background noise is, still doesn’t get to seep in then either because the gate is very quickly responding to you not making a sound at a particular level. When you have stopped, just for that brief moment of making a sound, it shuts the gate very, very quickly. It’s all electronic so it can move literally at the speed of light, and if you’ve got the thing set just right, your audience will not be able to tell. The listening ear will not be able to tell on the other end that you’re dealing with a noise gate. You mentioned to once that your setup is the same whether the recording is going to be 12 minutes or 12 hours. What kind of audio equipment do you currently use for your voiceover work? Well I’ve got a microphone from Carvin, and it is an XLR mic. We run it completely straight, balanced with 48 volt phantom power on it. It’s a condenser mic so it picks up very, very rich sounds. Obviously I have a windscreen on that. We’re recording with Sonar, the next to latest version of Sonar. We’ll probably be upgrading soon. There’s far more elaborate software out there, far more elaborate programs for anyone to draw from, but the needs for simple voiceover work are not that complex. As a matter of fact, the program that I’m using far exceeds the need that I have on getting the recording into the machine, but that’s okay, that means that there’s going to be a nice crisp, clear recording, usually around at least 24, maybe 48-bit level. So we’re exceeding right out of the gate the 44.1 kHz frequencies of what you’d get off of a CD, of what the limitations of a CD would be. We’re already recording it better than standards. So, if we ever reduce audio down to the CD level, the initial recordings are better than what you would expect when you go and purchase something out of a store. Not that any of us could really tell with our ear; the fact of the matter is recording things this way just allows you to not lose anything. 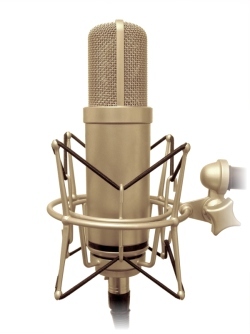 Speaking of microphones, what should someone look for when choosing a microphone for voice recording? And is it different if you’re singing as opposed to speaking? Yes. There are differences. Depending on your application you have to figure out what the best kind of mic is for your application. If you are trying to record a complete room, well then you’re wanting an omnidirectional mic. If you’re trying to record a person speaking straight on into that mic, or maybe an instrument playing directly into it, then you would go for the unidirectional. Meaning from one direction. The mic that I use is unidirectional. There’s a sweet spot, and wherever you can position your mouth in relevance to your mic or whatever’s making the noise you’re trying to record in relevance to the mic, you adjust it in that uni position, that one position that’s the sweet spot for that mic. That gives you the best sound for the recording. If you’re going with an omnidirectional, you may have 4 or 5 omni mics strategically placed around the room. What about the computer? Can you do audio work with a simple desktop system or does it have to be a $3,000 computer with some fancy audio card? It used to have to be a fancy $3,000 computer. Now we’re up into 48 and 96 bit recording arenas, but 24 bit was the lowest anyone could go if you were going to be real serious in capturing audio on your computer and the processing speed – we just didn’t have a lot of that back then. So $3,000 was not out of the question. You really had to have a beefy machine back then and what made it so costly, aside from obviously the processor, was the separate sound card. You needed these very specialized sound cards and all the RAM that you could possibly get put into these machines. Of course hard drive price was at a premium back then and if you were going to do anything more than a minute or two recording at a time, you’d better have a very fast hard drive. You had to have processors with L1 and L2 cache that was just maxed out as much as possible, giving as much buffer as you possibly could to the hard drives because they just were not transferring data. Hard drives back then, if they even had a buffer at all, were certainly nothing to write home about. So you had to get the fastest drives possible. 5400 rpm would never do. Anything under 7200 rpm would just cause a lot of hiccups in the audio when it would go to write out of the memory. And of course if you didn’t have enough RAM, well you’d wind up crashing your system or just all sorts of stuff, trying to get throughput back to the drive. So yeah there were many growing pains back then. But fortunately a lot of people stuck with it and hardware prices came down. You can literally now set up a turnkey studio, with the recording software from Sonar, you can do this for around $600-700 now and have a very nice system. Does that include the $200 microphone? No, absolutely not. You gotta buy gas for your car too. What would you recommend to someone who is interested in starting to record voiceovers? Like training, demos, lots of practice, that sort of thing? Well, back when, if we weren’t in today’s age, I would say call up radio stations and see if the DJs would release their little demo recordings. A lot of DJs would do that; they would just put out their stuff like that, or you could flip back from one radio station to another and listen to the commercials, because the commercials contain a tremendous amount of talent. They’ve got to sell people on the idea that those people in the local area – their good name is going to sound great coming out of that box at the radio station. And the only way to do that is to show pizzazz in the voice so the radio stations were looking to get as many different ways of speaking and saying various things out, becomes their commercials. That’s a great way to study what’s going on. In today’s more so modern technological advances, I would say if someone’s interested, is to go online to various radio stations and find the individual web site for each one of the DJs. There’s just a preponderance of information available on the web. Free audio out there on various talents’ web sites – a DJ or someone doing voiceover, that’s called a “talent” – that’s what you’re going to be if you’re getting into this line, so you stumble onto their web sites, you find where their audio demos are, you download those and just have at it. And take a wide variety of what’s out there. You can get more now in one concerted effort in one sitting online and finding this information than you could flipping back and forth between radio stations for an entire month. You can really go out there and get a lot of this audio down and in front of you so that you can consume it at your own pace. Would you recommend that someone get a voice coach or acting lessons or some kind of formal training? Especially if it were someone younger, and maybe they have a great voice but they’re not so good on their pronunciation, or maybe they’re not so good on being able to speak the King’s English without an accent applied, a voice coach is something they could explore, but most people can just listen to sitcoms. If they can hear something and then replicate it with their own voice, they can work around whatever their local social conditioning is. But they have to be able to hear it. Great speaking isn’t about speaking, it’s about hearing and converting that into the presentation. You’ve got to be able to hear it first, even if you’re just hearing it in your head you’ve got to be able to hear it first before you can present it. Sadly, that’s a step that most people skip. I know a lot of voiceover professionals work out of their homes. What kind of challenges are there with working out of a home studio? Other people. If you’re not living in your own bat cave; if you don’t have absolute control over your environment; you might even be living alone and recording in an apartment arena but your next door neighbors have kids or maybe they like to fight a lot and beat on the walls – who knows what – but if you cannot control your recording environment, it’s just nothing but frustration. You’ve got to be able to control the world around you because if you can’t do that and reduce stress – because that’s going to come out in your voice too – if this isn’t something that is easy for you to control, then maybe you ought to consider moving or taking on another line of work or whatever. You’ve really got to be able to convey for your client whatever it is that they’re wanting, and if the stress is coming through your voice, that’s a big problem. The other thing is, other people have lives too and they cannot operate around your schedule or your client’s schedule, so you know, many people who do this type of work, typically work late at night, they’re more so on the end of a recluse. If they can’t do full sound proof they’ll keep their studio as isolated as possible. It’s sometimes very difficult, but you don’t want to have to go back and fix something in post by canceling out sounds unless it was something you accidentally boo-booed during the recording and didn’t fix in real time. Other than that, trying to cancel out all other types of noises after-the-fact, you’re going to quadruple if not even more of the time you spend in this versus putting something in the can and getting it to your client. You shouldn’t have to fix that much in post outside of just the things you’re responsible for personally. You can’t take on the rest of the planet because that too will be recorded if you can’t control your environment. That’s one of the biggest frustrations about any of this is the working at home element. You’ve got to be able to cage yourself off somewhere; and it’s not just about the passerby or the random noise or someone setting something down on the coffee table, it could be something as simple as a ticking clock in the other room. Believe it or not it could be that. Or the dog that’s been sleeping all night and you’ve just gotten full stride and are in your first minute or minute and a half of recording and it’s fixing to go very well and all of a sudden the dog will bark for no apparent reason. If you’re not controlling your explosion, if you’re not controlling your surroundings, then you’re just in for a huge emotional ride. 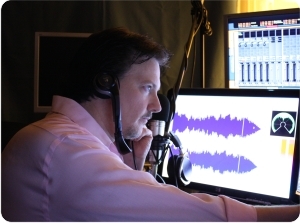 About the author: Max Laing has spent years working with audio professionals for over 20 years. His latest endeavor, the 2 CD dichotic audio kit titled Allowing Success is helping individuals around the globe to realize their own potential.